What Goes On Inside A Fortune 10 #infographic ~ Visualistan '+g+"
When you make a family budget you track all your money coming in and all your expenses going out. Things can get pretty complicated even just for a small family- one person may have extra medical bills one month while another wants to start a new and expensive hobby. Keeping track can be a real pain. Now imagine that instead of a family you are keeping track of the expenses of a Fortune 10 corporation and all its subsidiaries. 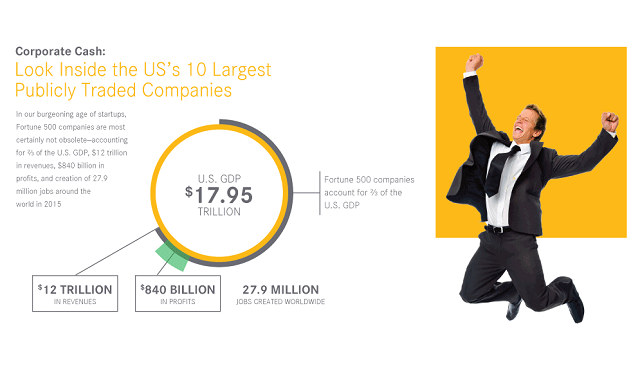 Some companies on the Fortune 10 list have dozens of subsidiaries, and that doesn’t even count all the branches, locations, and satellite locations. Managing cash flow at this level takes a serious level of expertise as well as a huge quantity of time. Just knowing how much you are paying for electricity in a given month across all subsidiaries can be difficult to figure out. Fortunately there are technological solutions for cash flow management that can reduce the complexity of corporate accounting. Learn more from this infographic.